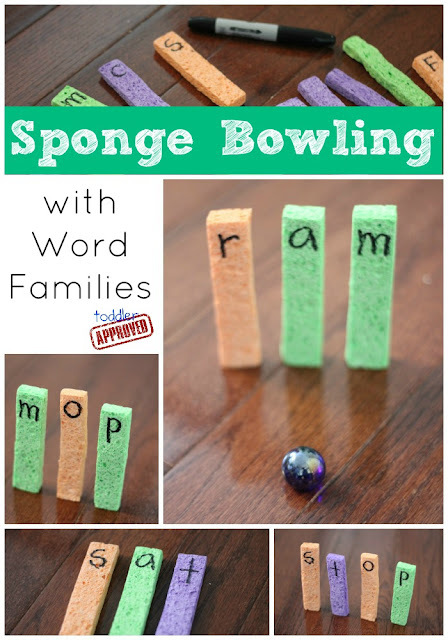 This sponge bowling activity is a fun way to practice making and sounding out words along with working on some basic hand-eye coordination. I also love it because it is a great quiet time learning activity! You can do this simple activity with just a few sponge strips, a Sharpie, a flat surface, and a bowling ball (we used a small marble, though you could use a quieter softer ball). We made Sponge Towers not long ago and just used some of our old sponge strips from that project for this game. Cut sponges into strips or different shapes. Build some words with (or for) your child. Stand them up like bowling pins. Have your child try and sound out the word... once he reads the word, he can knock it down with a bowling ball! * You may have to cut the sponge bottoms to make them more flat since some bend more than others in the packaging. Keep building and playing and having fun with words! Write all of the alphabet letters on the sponge pieces and have your child knock down the different sponge pieces and talk about which letter(s) he knocks down. Talk about the colors of the sponges and encourage toddlers to say the names of the colored pins that they knock down! If they don't know their colors yet, then you can tell them which colors they knocked down! If you haven't entered yet, our My Angel Said What? Giveaway is running until tonight, September 11th at 11:59pm PST... so go enter now! Also, there is only day left to register for Amanda Morgan's Parenting with Positive Guidance: Tools for Building Discipline from the Inside Out. Go quickly and sign up if you haven't already!!! I can't wait for the course to start! I'm adding this one to my list of reading games! This will be a big hit with my kindergarten sidekick - thanks for sharing! I could see doing this with clip clothes pins too. They would stand up easily; you can write on the pins with different colors and you can pinch the clips onto cardstock for other word-building fun. Great idea! Putting letter stickers on blocks could be fun too!